This model is the AHI No. 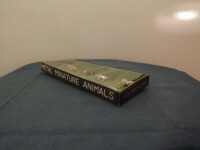 5809 Farm Animal Set in various colours. The set has four cows and four horses, each approximately 30mm to 38mm in length and 20mm to 25mm in height. They are molded in one piece that includes, in one case, the base stand. 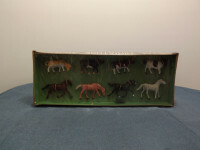 The base stand and figures have no manufacturer's mark or country of origin details. 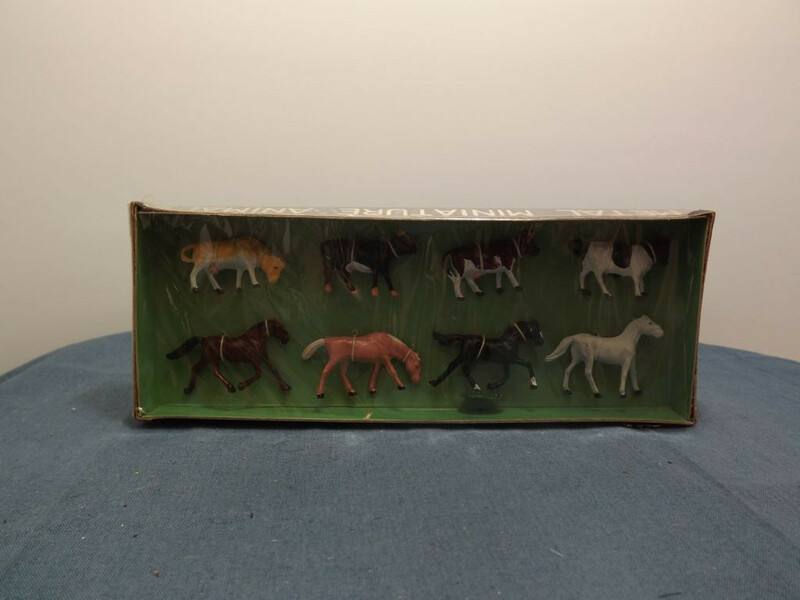 The set comes in the distinctive, but in this case dark blue, cardboard packaging associated with this brand of toys and the flat tray has clear cellophane wrapped all around it. The cellophane is open and missing from one end. The dark blue card tray has a green inner and carries a white panel on the left hand end which has "No. 5809" in black or very dark blue text on it. 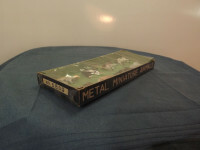 The front and rear sides have "Metal Miniature Figures" in large white lettering centred in the middle of the side and the right hand end has "Patent No 181733-181827" in smaller white text. 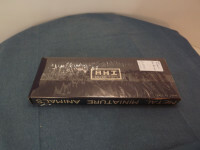 The bottom of the tray is also dark blue with white lettering that states "Made in Japan" in the bottom right corner and has the AHI logo in the centre (as shown in photo). I do not know exactly when this item was issued but it would have been between 1950 and the early 1960s.